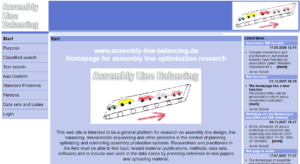 Welcome to the homepage for Assembly Line Balancing. Here you can download data sets and codes for diverse assembly line balancing problems provided by researchers. There is no claim for completeness because only some researchers provide this site with respective material. If you are interested in making available own codes or data sets in the field of assembly line balancing, please do not hesitate to contact us. This website replaces the old „Homepage for assembly line optimization research“ which was online for more than a decade. The authors were not able to maintain this site anymore.